Silicon wafers are ordinarily highly conductive and easy to measure with standard capacitive displacement sensors (See MTI’s Proforma 300i). Measuring the thickness of GaAs wafers that have high bulk resistivity (>10k Ohm/cm) is a little more difficult because the wafers act as non-conductive insulators in a capacitive sensor’s measuring field. Fortunately, MTI has a solution to this problem. It’s possible to measure the thickness and TTV of high resistivity semiconducting wafers (like GaAs) using non-contact capacitive sensor technology. Accuracy demands the dielectric constant or permittivity of the wafer being measured remain constant. Manufacturing wafer material requires control and measurement to remain consistent; thickness ranges need to be less than several millimeters. Sapphire is a single crystal Al2O3 with a hexagonal (rhombohedral) crystal structure. Sapphire wafers and sapphire substrates are available in C, R, A and M plane orientations. GaAs moves electrons faster while consuming less power. Think of your cell phone. Tight spaces and short battery life. GaAs provides a real advantage over silicon for some components. Indium Phosphide (InP) is a key semiconductor material that enables optical systems to deliver the performance required for data center, mobile backhaul, metro and long-haul applications. 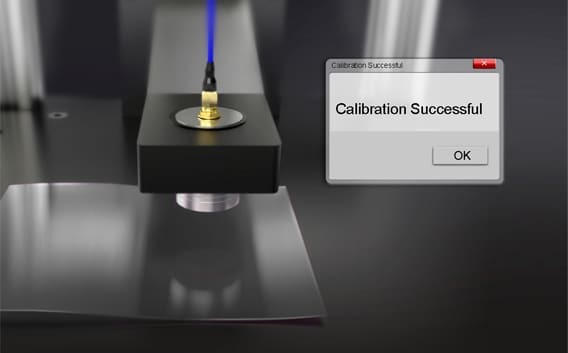 The same program assists in setting up the initial calibration needed to measure thickness with a few simple steps that are easy to follow. Set up is quick and easy. Simply determine the range limit of the probe (by adjusting the height until the indicator on the amplifier just turns blue and before it turns red) and entering zero in the first sample thickness. 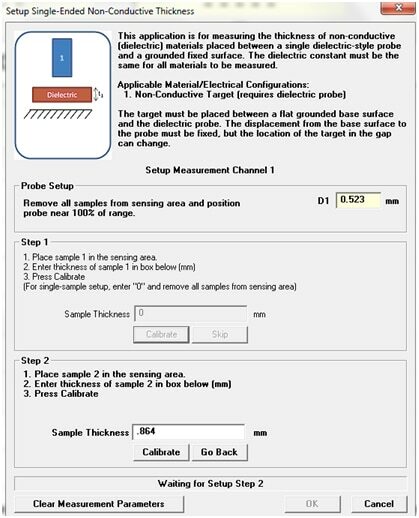 Press “calibrate” and place a wafer of known thickness between the probe and ground plane. Now enter the known thickness into the second sample thickness and calibrate the second sample. This has stored the dielectric constant which will be used to measure all remaining wafers. The Digital AccumeasureTM Capacitance Amplifier is also perfect for measuring other non-conductive commodities such as Plastic, Glass, Closed Cell Foam, Paper, and Rubber. MTI Instruments, Inc. offers several styles and types of non-contact sensors that can be customized to your exact requirements. If you have a difficult application to solve, contact our experienced team of application engineers who will thoroughly analyze your requirements and guide you to a practical, cost-effective solution.